St. Pauls Fire District works to safeguard the lives and property of the communities that make up the district as well as to enhance the quality of life of our residents through professionalism, dedication, integrity, education, and training. 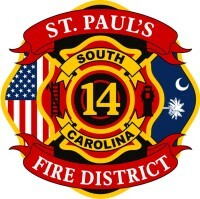 The men and women of the St. Pauls Fire District are committed to providing a wide range of emergency response services, fire prevention programs, & fire safety education programs, while ensuring the safety of all employees and volunteers so that they are able to return to their families after their duty has ended. All Charleston County citizens: if you had or have any damage from hurricane Florence, you can direct them to charlestoncounty.org there is a banner at the top of the page; Citicens can click on the banner and report any damages directly to the county and will be used for INFORMATION ONLY! When (if) FEMA sets up recovery centers the citizens will still have to report there and complete the necessary applications.